SILICON VALLEY, CALIFORNIA, (Sep 07, 2016) — AGNITY Global, Inc. (AGNITY), a leading global provider of intelligent business communication applications and infrastructure for telecommunication service providers, announced today that TMCnet, the leading website building communities online, in person and in print for communications and technology markets, has named them a recipient of the first annual 2016 Tech Culture Awards. “We are overwhelmed and thrilled to receive this award from TMC,” said Sanjeev Chawla, President and CEO of AGNITY Global, Inc. “Culture of a company reflects the way a company conducts itself and cares for its employees. Employees form the fundamental building blocks for any software company. AGNITY Global clearly understands that employees can be loyal, productive, and efficient if the company has happy and caring culture”. “At AGNITY, we always work hard in creating a healthy and cordial work environment for our employees, said Subhash Verma, Managing Director and VP-Engineering of AGNITY Global. “We believe in creating a workplace where each employee gets an opportunity to grow personally and professionally”. AGNITY’s innovative products use the latest and cutting edge technologies that help the employees to enhance their professional skills and stay more competitive in the market. AGNITY encourages freedom, free flow of ideas, and transparency. AGNITY completely understands the importance of work life balance and provides a flexible working environment to its employees. “The mission of these Tech Culture Awards is quite simple. We have surveyed and selected companies who are looking for the best and brightest tech talent and are willing to go the extra mile to provide what they believe is the ideal tech culture”, said Rich Tehrani, TMC’s CEO and Group Editor-in-Chief for TMCnet. “AGNITY Global has demonstrated to the editors of TMCnet that they are committed to growth through providing a truly distinct and upbeat environment and for that we applaud and recognize them,” added Tehrani. 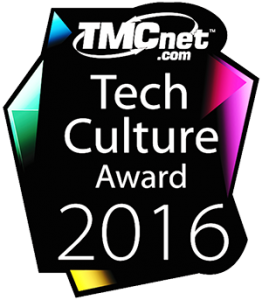 The complete list of Tech Culture Award winners for 2016 are now posted on the Tech Culture blog on TMCnet. Winners will also be featured on TMCnet.